Bob Gerrity is responsible for all aspects of Monash University Library with a particular focus on building conducive learning and research environments, enhancing the relevance and discovery of our information resources, building staff capability, and ensuring the delivery of enriching public programs and outreach. 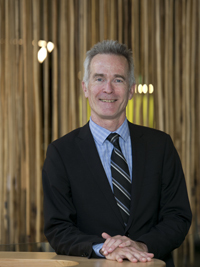 Prior to his appointment at Monash in March 2018, Mr Gerrity was the University Librarian at the University of Queensland (2012-2017). Earlier he spent 19 years in technology leadership positions at the Boston Public Library and the Boston College Libraries. Mr Gerrity is particularly interested in the application of current and emerging technologies to ensure that library collections, spaces, and services remain relevant in the digital environment and deliver the greatest possible benefit to Monash students, academics, and researchers. Mr Gerrity is a member of the Executive Committee of the Council of Australian University Librarians (CAUL) and the Libraries Australia Advisory Committee (LAAC), and several library industry advisory boards.